At Her(B) Life we recently had the opportunity to test out this candle and we burned it during our last team meeting so that everyone could check it out. Now, we're super excited to share our thoughts with you. ICYMI: Soy wax burns roughly 50% slower than regular paraffin wax and still generally costs less than beeswax so if you're a bargain hunter you really can't beat soy. Soy candles also tend to burn more evenly, which means less wasted wax on the inside of the jar AND they typically burn cleaner than regular paraffin candles do. As a result, they don’t produce much black soot. Fun fact: Due to soy's lower melting point, liquid wax tends to pool around the wick and it's from this liquid wax pool and the wick itself that the essential oils evaporate into the atmosphere, leaving you with a stronger scent which is great when you have a candle that smells this good! Soy candles are made from vegetable oil and have that lower melting point that I mentioned earlier, they produce no soot or carcinogens so they are a much healthier alternative for you, your pets and the environment. It's so fitting and appropriate that P.F. 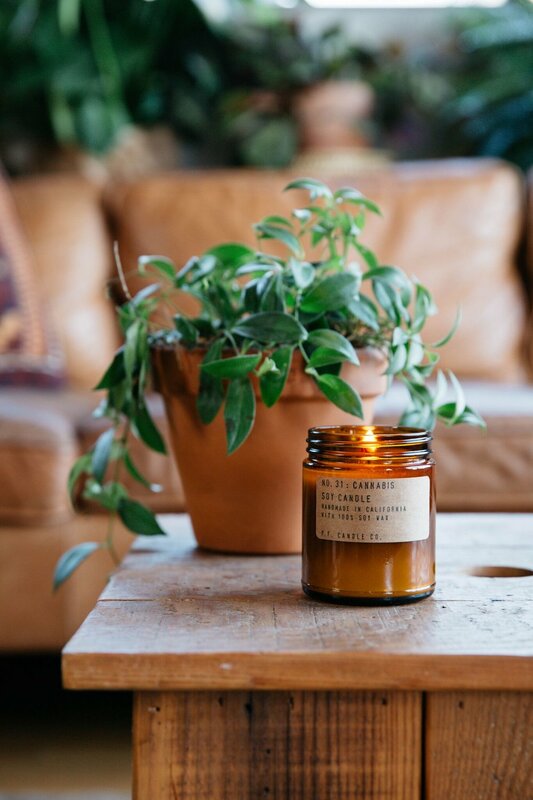 Candle Co. chose to honour the cannabis plant with their beautiful hand-poured candles. You may not realize this but up until 2003 candle makers often used lead core wicks. Originally lead core wicks were used to keep the wick firm and straight but we've come to realize that when they burn they release harmful materials into the air and have since been banned. Today, roughly 80% of candles manufactured in the USA are all cotton or a cotton blend while the rest are made with primarily metal- and paper-cored wicks. The metal in wicks today are typically zinc or tin. They are most often used in container candles and votives to keep the wick upright when the surrounding wax liquefies. Our office is small and cozy so overly strong fragrances are not always appreciated but there wasn't a single Her(B) Lifer who had any complaints about this candle. We all really liked the heady warm fragrance and let's face it, nothing beats a lovely candle giving off a soft glow while you work or relax. In fact we would gift this candle to our bestie for her self care routine or to our Valentine so we can spice things up this month! Get your cannabis scented candle here.